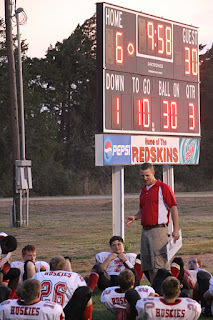 As most readers of my blog know, I am an avid watcher of small town, 8-man, fast paced football. Read a previous post of mine, "My Boys of Fall." I do like when my alma mater Kansas State wins, but I can only tell you the names of one or two players...okay, one. But a good friend of mine works in helping people who have made some bad decisions straighten themselves out--and he uses the analogy of football! I asked him to share his thoughts with my readers as a guest blogger. So, meet Jay Egger, a great guy from Small Town Kansas who sits on the bleachers near me and explains the game! I am of the opinion that the game of football is THE sport that, if coached correctly and responsibly, teaches a young man (or young woman) many important values that could benefit them throughout the rest of their lives. Now certainly, there are many other sports and academic disciplines that are just as important to a young person, but if you would indulge me, I would like to share with you my thoughts on why football encompasses those traits that I feel are important for our children. I know a young man who was on probation for a simple misdemeanor conviction and had more recently been arrested for beating up his 19 year old pregnant girlfriend. He was only 20 and had just been released from jail for the third time in the last 18 months and was looking at the possibility of spending the next year in jail. He grew up on the east coast and was raised by his grandmother who had recently died. His mother was in prison and he had no idea who his father was. To say he felt alone is an understatement. It was obvious that this young man was starting his young adult life making some very bad choices and was leading his life down a very destructive path. In talking with this young man he was sure that he wasn’t at fault. Law Enforcement was singling him out and picking on him because they knew he had a record. He failed to take responsibility for his actions, always blaming someone else for his misfortunes in life. He was convinced that since he practically raised himself, he didn’t need anyone elses help and was just fine being alone. I asked him if he played High School sports. “Of course I did. I played football” he exclaimed, as if that was something you had to do to graduate. I asked him if he was very good and if he played much. He began to share with me a list of impressive statistics and accolades that he earned. I asked him if he earned all of those achievements on his own, or if he played on a team. He gave me a puzzled look. I began to share with him my thoughts and philosophy of why the game of football is the perfect game in preparing a young man for life. First, it’s a team sport. You must rely on your teammates to work together toward a common goal. It starts with an individual effort, giving your very best in concert with other individuals in order to help the team fulfill its mission, to win. This is not unlike any other profession, or discipline that a person enters into after high school. To be successful, a businessman, salesman, doctor, teacher, clerk, etc. must do his or her best and expect that out of each fellow employee to allow the organization to succeed. Second, the values that one learns from the game are immeasurable. Preparation, hard work, positive attitude, and desire can make up for a lack of skill and will carry a child through the next stage in their life, if not the rest of their life. Success is earned irregardless what we here in the media. Some of us have to work harder to succeed than others, due in part to our genetic makeup, family nurturing, or the community in which we live and are raised. We are not all gifted athletes or Rhodes Scholars, many of us are raised by single parents, and few of us are born with a silver spoon in our mouth. 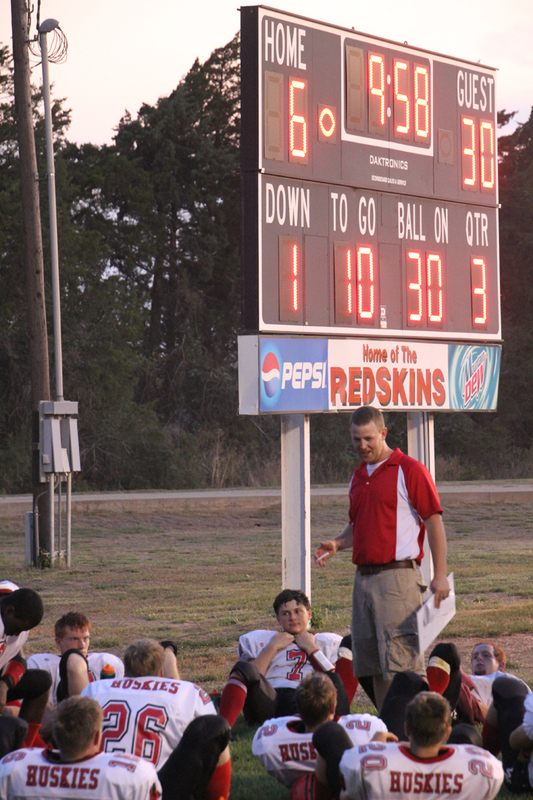 Football inspires young kids to dedicate themselves to something much bigger than themselves. The hard work and sweat that they share forges a bond which causes them to believe that there is nothing they can’t do together; believing that success is earned through “sweat equity”. General Douglas MacArthur once said, “On the fields of friendly strife are sown the seeds that on other fields on other days shall bear the fruits of victory”. This quote is inscribed and displayed in the gymnasium at the United States Military Academy today. We can all be satisfied when life is going well. The game of football teaches the athlete that it’s those times of difficulty that show the strength of character in all of us. What will a young athlete do when its 40 degrees, raining, the wind is blowing, and they are down by four touchdowns in the first half? They are already hurting, tired, cold, and wet. It’s 3rd down and long and you are just outside your own goal line. The other team is stronger and faster, and no one expects you to win. What do you do? It would be easy to give up and pack it in. But they have worked too hard to quit. They represent their school, their friends, their family, and their community. There is no chance of winning if you quit, and hope remains as long as you keep working. For many of these kids, this is merely a glimpse of just how tough life can be. This is a classroom that tests them each Friday night on how they will handle adversity, AND success. They learn about themselves and can draw from these experiences later in life when they may experience real adversity like losing a job, going through a divorce, or discovering that you or a loved one has cancer or other serious illness. For those of you who have experienced these difficult times, how has a positive attitude, hard work and preparation sustained you? Who did you draw strength from, or go to for encouragement? Did you have a ‘team’ fighting for you? A student certainly learns these traits in a classroom and the results are shown in their test scores, report cards, and scholarships awarded, etc. Special shows, exhibitions, recitals, and other competitions are other avenues in which our students receive that feedback for their work in a myriad of disciplines. That is something that they can do as an individual, for the rest of their life, if they choose to. Football on the other hand, is an activity for the young. I believe this is what really sets football apart from other activities. I don’t know the actual statistic but it is not likely that a football player will ever play the game again after high school. To a kid who has worked so hard since middle school (some start earlier than that) their future is right now. I recently heard that it is quite normal for a young man to go through a sort of post-partum depression after playing his final football game. I certainly felt it when I concluded my final football season many years ago. The realization that you will no longer play a sport that has had such a dramatic influence in your life is tough for a 17 year old to grasp. It’s hard to imagine a 17 yr old with a career, let alone the fact that that ‘career’ is over. A student can continue to further their education, an artist can continue to draw, sculpt, or paint, and a musician can continue to play. Even a basketball or softball player can play on leagues or tournaments for years to come. A football player however, will likely never put on those pads and helmet again. Coaches tell their players to play every down as if it was their last. We draw inspiration from those stricken with disease that live each of their days as if it was their last. As an athlete or as a person, what will you do today that will make an impact on your team, your family, or your community? I was asked recently why it was so important that our kids risk injury, particularly life-long injury just to play a game of football. The risk is just too high, and it only appears that the game is only played to feed a testosterone-filled ego. There is certainly risk, I don’t argue that and we all hear tragic stories every year about kids being injured in a game or practice. I wonder what the percentages are if we compare the number of those tragic football injuries with the total number of athletes who play the game and are not injured. I am sure they are very small. It should also be considered that there are lessons that can be learned through the injury as well. I also imagine that the percentage of those injured from football is even smaller when compared to the number of kids who are seriously injured each year in our society from acts of violence, alcohol or drug related incidents, vehicle accidents, or other tragedies that befall a teenager. Finally, the sportsmanship and discipline that a kid learns can not only affect THEIR life, but tends to inspire those around them. Encouraging a fellow player, respecting your opponent, giving a kind word, or doing a kind deed for others are actions that should be revered by athletes, coaches, family, and friends. After sharing my thoughts with this young man, he looked at me and said, “No one ever explained football to me like that before.” I thought it a tragedy that no one taught him these traits and, more importantly, how he can apply them to his life. This young man ended up spending 6 months in jail and successfully completed his probation. Since then, he has moved back home, got married and has a young daughter. He is currently enrolled in a university where he hopes to earn his degree in psychology and become a high school guidance counselor and football coach. Those will be some lucky kids. I know that not everyone is able to play football, just like I am not cut out to be an airline pilot, a medical professional, or a carpenter. I do however, feel strongly that football is a very important activity for those who are able to play, that can help develop those values that aren’t always taught at home. We send our children to school to receive a basic education. That education is not just dealing with the three R’s anymore and it has never been the sole responsibility of our teachers. Too often our teachers bear the brunt of introducing and teaching those values such as goal setting, dedication, hard work, and sportsmanship because they aren’t taught them at home but that is a separate issue for another time. Well said! Enjoyed every word! Thanks, friends, for commenting on Jay's guest post. I learned so much from 8-man football this year (gee, I've only been watching it for 6 years) and Jay and his wife Tarra are very helpful to me. They are great friends who also love the Small Town Life!